This is the simpliest teen scavenger hunt ever! The object of the game is to come home with the BIGGEST or BEST item. The last time my girl friend's daughter played this scavenger hunt, her team came home with such a BIG item that the neighbor who gave it to them had to lend her garden wagon just so they could get it home!! You will be amazed at the stories you will hear from each team. It is so fun to hear the succession of items; how they traded this thingy-ma-jig for that what-cha-ma-call-it. I can't believe how easy this activity is and the kids have a blast playing. Set-Up No prior set up is required for this activity. 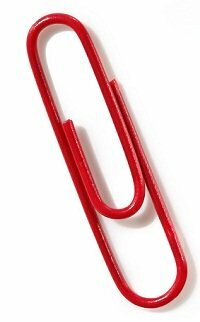 Equipment: You will need as many paper clips as you have teams. How to Play: Each team goes door to door in the neighborhood. One of the team members will ask the person at the first house if they will trade them something bigger or better than the paper clip. The team then gives the paper clip to the neighbor and leaves with the item they traded for. At the next house, a team member asks this neighbor to trade for soemthing bigger or better than what they just received at the last neighbor's house. This continues until the time limit has been reached. All teams must be back at the starting point within one hour. Judging: The teams look at all the items brought back. Each participant gets to vote for the item they believe is the BIGGEST or BEST item. In the event of a tie, the host of the party must cast the final vote. Comment from Grammi Carolyn in Wisconsin: We played this game as a 4th of July party with 2 teams of various age groups. We had a blast and got to interact with out neighbors who had fun playing along with us. Only one neighbor was unwilling to play. We had some fun items given to us. The problem we had was that most neighbors did not want to keep the item we were trading. They would insist we take both the new & old item. So we ended up with a bag full. Then when we returned home, some of my team wanted to choose the item they wanted to submit instead of just the last item we collected. Another problem we had was that we got a really cool item that we wanted to keep as our biggest, but still had some houses to go to. It got traded and we lost it. My question is can you just quit when you want or do you have to go to a certain amount of houses? And do you have to submit the LAST item you collected or can you choose? Answer: The team can stop before the one hour time limit is up if they believe they have a winning item in their possession. The team would not have to submit their last item if they had several to choose from. Great questions! Thank you for sharing your experience with this scavenger hunt.